Changelly positions itself as the fair, fast and trusty cryptocurrency trading service. Rather than run its own exchange, Changelly’s automated systems run the trades through exchanges like Poloniex and Bittrex to find the best rates. This approach affords greater privacy than other crypto exchanges. In addition, since Changelly only holds funds for the brief time the trades are being made, there’s no centralized wallet for hackers to target. Customers can exchange more than 90 kinds of altcoins and even purchase them with a credit card. Where cryptocurrency exchanges try to reproduce the advanced tools and interfaces of more traditional stock trading apps, Changelly focuses on providing a simple, convenient experience for swapping currency. Access to a large listing of cryptocurrencies. Secure system minimizes hacking risks. Dollar and euro purchases of Bitcoins with credit cards. Very steep 10% credit card processing fees. Advanced traders can get better deals elsewhere. Unreliable exchange rate estimates in volatile markets. What Can You Trade on Changelly? Changelly’s origins trace back to the cloud-based blockchain mining pool MinerGate. The MinerGate uses distributed computing to farm out processing tasks to its members’ desktops. Those members earn Bitcoins and other cryptocurrencies based on their computers’ share of the pooled processing power. That simplicity-based approach seems to have resonated with the crypto community. Changelly celebrated its birthday in April 2017 by announcing it had passed the 100,000 user milestone and now supported more than 30 cryptocurrencies. Changelly now has more than 1.5 million users and supports trades in more than 90 cryptocurrencies. Even after the slump in Bitcoin prices, Changelly has been signing up 60,000-70,000 new users every month. Simplicity meets the needs of crypto holders and the merchants who want to do business with them. But Changelly sees other opportunities in the cryptocurrency market. In 2017, a team from Changelly launched an independent financial service called Oxygen. Bank of America Merrill Lynch and Goldman Sachs veteran Alex Grebnev leads the new service with Changelly co-founder Alex Melikhov serving as chief operating officer. Based in London, Oxygen is a “decentralized repo trading platform” for cryptocurrencies. “Repo” is financial industry shorthand for “repurchase agreements”. A party sells a security and agrees to repurchase them at a predetermined price on a specific date. Instead of letting your coins sit in a digital wallet, Oxygen puts your digital assets to work. You lend your coins to a borrower who agrees to repay the loan, with interest, on a certain date. An Ethereum Smart Contract holds cryptocurrency assets that the lender provides as collateral. As with many organizations in the cryptocurrency industry, the leadership structure at Changelly is not clear. When the trading service first appeared on media radars, MinerGate CEO Claude Lecomte was Changelly’s public face. By the end of 2016, co-founder Konstantin Gladych held the reins. Gladych’s career prior to Changelly was in mobile app development. Charlie Shrem, the founder of the Bitcoin Foundation and leader of now-defunct exchange BitInstant, advises the Changelly team on business development. “I only work with companies I think have a bright future and I think Changelly is one of them,” Shrem told CoinTelegraph. Shrem was sentenced to US federal prison in 2014 for his role in a money-laundering scheme in which he used BitInstant to help users of the Silk Road black market. Changelly does not allow trades in fiat currencies which helps it steer clear of some financial regulations. That does not mean, however, that Changelly’s leadership refuses to work with governments. For example, when funds from the WannaCry ransomware attack suddenly shifted from Bitcoin to Monero, some of the exchanges passed through Changelly’s system. Gladych discussed how his team cooperated with European cybercrime investigators to track the currency flows. Automated systems also monitor the Changelly trades for signs of suspicious activities. Any transactions that raise red flags get frozen until the Changelly security team can conduct a Know Your Customer investigation. The small staff and large workloads make this a drawn-out process as more than one Changelly customer has discovered. 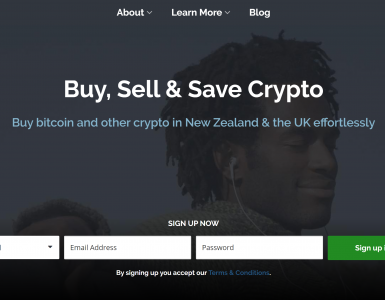 Although Changelly does accept new coins to its listings, the trading service does not explain its policies on its website. Teams must contact Changelly directly through a Google Form. Most digital exchanges hold 80% to 90% of their customers’ assets in cold wallets, only keeping the remainder in hot wallets to support trades. Those centralized wallets containing thousands of altcoins are a constant temptation for hackers and embezzlers. Changelly makes for a much less tempting target since the trading service does not hold its customers’ assets for more than a few milliseconds. The only time coins pass from the customer to Changelly is when the customer initiates an order. Those coins almost immediately flow to an exchange like Bittrex for conversion into another cryptocurrency. The exchanged amount passes briefly through the Changelly wallet before getting deposited directly to the customer’s wallet. With no long-term holdings of customer assets, there’s no centralized wallet for hackers to target. Changelly and its London-based credit card processor, IndaCoin Limited, apply several security measures when you purchase cryptocurrency with a credit card. All purchases must be made with a 3D Secure system such as Verified by Visa or MasterCard SecureCode. You must provide a phone number associated with the credit card when you initiate the purchase. IndaCoin’s automated system will call that number to provide an authentication code. You must also provide a security code from your bank statement or else upload a verification selfie. Australia, Canada and the United States: You must limit your purchases for the first month. The first purchase can be no more than $50 and the second purchase no more than $100. You can make as many as three purchases within the first week, but you must wait at least four days to make your second purchase. After the first week, you can many purchases as you want, but with a $500 limit. Commonwealth of Independent States: The first transaction can be no more than $200, the first week no more than $2000 and the first month no more than $10,000. All limits go away after the first month. European Union and other countries: The first purchase must be less than $100, the second purchase less than $200. All purchases made after the first week have a $500 limit. You must wait four days to make your second purchase and can make up to six purchases within the first seven days. All restrictions disappear after the first month. Changelly relies on the simplicity of its interface to reduce the need for customer support. An FAQ page is the only self-help resource available to Changelly customers. A ticket-based email support system handles any issues that customers cannot resolve through the FAQ articles. Changelly also moderates its own subreddit. Most complaints about Changelly center around the time it takes for trades to execute. When trading volatile currencies, the difference between the estimated exchange rate and the actual exchange rate can be significant. Of course, nobody places outraged posts on Reddit when that works in their favor. The 0.5% transaction fee is another source of complaints. These seem to come from experienced traders who have the skills to get lower fees by trading directly on the big exchanges. Like every other part of the cryptocurrency ecosystem, the spectacular growth in new users last year put a strain on Changelly’s systems. In response, the trading service doubled its customer support staff in mid-2017. That staff increase was not enough. By the end of 2017, the demand for support exceeded capacity nearly three-fold. Gladych posted an apology and explained that a new hiring wave was underway as well as system changes that should improve support quality. Changelly accepts traders from all over the world. It is up to you to know how local laws affect your right to use cryptocurrency. When Changelly first launched in 2015, English was the default language. The rapid growth over the succeeding years meant nearly half of Changelly’s customers are now non-English speakers. 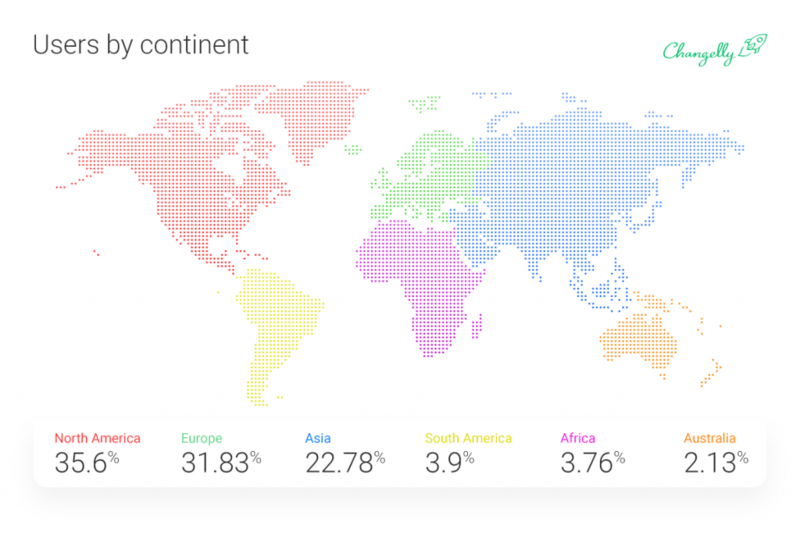 In late 2017, Changelly added localization in eleven languages. Customers can now conduct their trading in Arabic, Chinese, French, German, Hindi, Japanese, Korean, Portuguese, Russian, Spanish or Vietnamese. Changelly only asks for your email address when you create an account. Alternatively, you can use your social media accounts to log in. Although Changelly does not publish the details on its website, there is a KYC process that kicks in when suspicious trades get flagged. Changelly provides an API that businesses can use to integrate their systems with the trading service. Changelly supports trades of more than 90 cryptocurrencies. 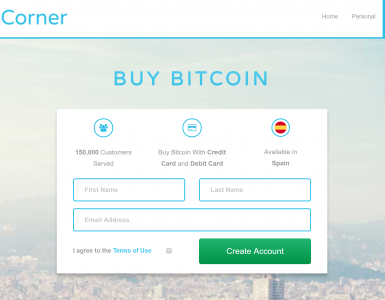 Changelly accepts credit card purchases of Bitcoins in either euros or US dollars. You cannot make credit card purchases of any other digital currency. You may also run into issues with your bank which may not allow its customers to make bitcoin purchases. Changelly does not let you cash out your cryptocurrencies for fiat currency. Changelly limits fiat purchases to 35 digital currencies. The final amount you receive in the exchange may vary from the original estimates. That is because the exchange rate is not set until the actual trade takes place. Trade executions may take five to thirty minutes to actually happen depending on the each blockchain’s congestion levels. You can exchange as much or as little money as you want. The only limit Changelly sets is at the low end where the amount you are sending must cover the network fees charged by the blockchain. Changelly operates a simple currency-to-currency exchange service. As a result, you will not find any advanced trading tools. Joining Changelly is pretty simple. You can use your social media accounts or enter your email to activate an account. You will instantly arrive at the trading interface where you can place your first exchange request. Drop down boxes let you change the cryptocurrencies you want to trade. From there, the interface takes you to screens to enter your wallet addresses. If you want to purchase Bitcoins with a credit card, go back to the Changelly homepage and click on the “Buy Bitcoin with credit card” button. That will open a new window where you can place your order. The Account section lets you export your trading history, manage your password, set 2-factor authentication and change your sign-in method. Changelly does not have any mobile apps. Changelly does not hold customers’ assets so there are no deposits or withdrawals. All fees are transaction-based. Changelly charges a flat 0.5% transaction fee on top of any network fees a particular blockchain’s miners charge. If you make a credit card purchase, you will get hit with a 5% fee from Changelly and another 5% fee from Changelly’s credit card processor – a 10% total hit. 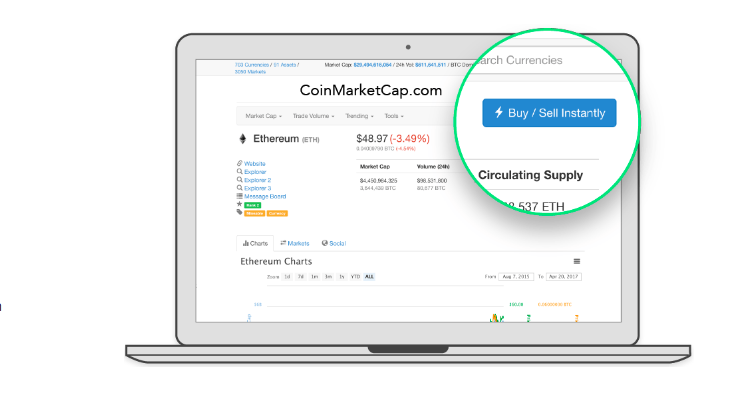 The Changelly Widget lets you add trading capabilities to your own website. 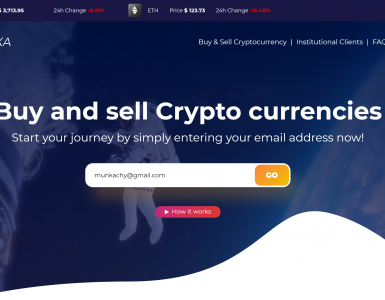 Visitors to your website can make credit card purchases or trade cryptocurrencies without having to go to the Changelly website. Every transaction will earn you a 50% commission of the transaction’s fees. To cash out your earnings, however, you must provide Changelly with data about your site. Referral links provide a less intrusive way to earn commissions. You can generate a referral link for your website or social media accounts. Anyone who clicks on the link will arrive on the Changelly homepage where they can create an account and start trading. Changelly will split its transaction fee with you 50-50 for as long as many years as that person trades. You can track the performance of your referrals from the Affiliate Dashboard section of your account. Changelly is good at what it does – making the crypto trading process as simple as possible. That simplicity, however, comes at a price: loss of control and high transaction fees. At times, when simplicity and convenience are more important, Changelly could be a useful element in your cryptocurrency toolkit. For people new to the cryptocurrency scene, Changelly is a friendly, accessible way to get started. The trading service does the heavy lifting of finding the best rates on its partner exchanges. And it uses a clean, simple interface that does not require a steep learning curve. Changelly is a convenient way to make those quick, one-off trades. Otherwise, experienced traders looking for a way to make high-volume, high-frequency trades should look elsewhere. They can make better fees at a lower cost by trading directly on exchanges like Kraken or Poloniex.